One of the meanings of lion tattoos has its basis in a fairy tale story of ‘The Wizard of Oz’. The story has a character of a cowardly lion, who wanted courage all his life. Thus, those who are a bit scared in their lives and want something to boost their courage, the lion tattoo meaning will surely help them muster up some courage. You may like to choose a sitting lion design, that is cool and regal in appearance. This lion tattoo means you are a person that is in charge of your strength and power. In order to gain respect, you do not need to show your teeth. A lion tattoo in attack pose, has a different meaning. This lion tattoos meaning gives out a signal that you won’t shy away from standing up to yourself. 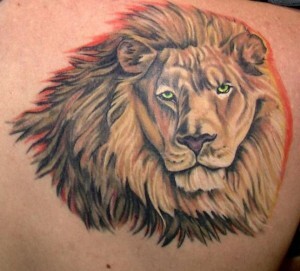 Lion tattoo meanings are also a way to represent your astrological sign of Leo. The Leo tattoo is a symbol of being a warm hearted person, who is generous, loving and a bit bossy, little patronizing and a tad arrogant. In case of Christianity, the lion tattoos meaning becomes an icon of justice and power. In Buddhism, the meaning of lion tattoos symbolizes knowledge and wisdom. It is a representation of the Lion Throne known as Simhasana, the throne of wisdom. In Hinduism it represents Lord Krishna, due to its radiating energy and aura. The Egyptians used the symbol of two lions sitting back to back to represent balance. The lion statues were placed outside many sacred places representing guardianship. Thus, the lion tattoos meaning hold true for the virtues of protection and security. The sword and lion is a symbol of power of Islam and one of the most popular designs in Persia. This was all about the male lion, the king of the beasts. 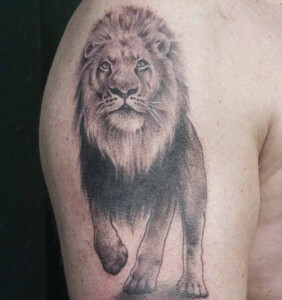 But, we should not overlook the tattoo designs that represent his better half, the lioness. The lioness is associated with the moon and in ancient Egypt, she was a symbol of maternity. The lioness was represented as the mother goddess that gave birth to all that exists. There is another legend among the many stories of King Arthur, that the lost city of Lyonesse or ‘she-lion’ lies just beyond the city of Cornwall.